Having litigated employment discrimination lawsuit in Florida state and federal courts for nearly twenty years, our Alachua County, Florida discrimination lawyers have learned that employers will always deny that an employment decision was motivated by discriminatory animus. Even when confronted with evidence that an employment decision was made for a discriminatory reason, employers will concede nothing and come up with explanations as to the alleged true meaning of the evidence. In putting their spin on evidence of discriminatory intent, employers invariably proffer purported facts intended to establish an ostensibly benign intent and explain away the evidence of discriminatory intent. The decision in Wheat v. Roberts & Willard, Inc., No. 16-282 (S.D. Ala. Sept. 26, 2017) illustrates that not all courts are willing to accept an employer’s explanation of an ostensibly benign motivation for an employment decision. In that case, Ralph Wheat (Wheat) sued his former employer, Rogers & Willard, Inc. (R & W), pursuant to the Age Discrimination in Employment Act (ADEA). Wheat claimed that R & W fired him because of his age in violation of the ADEA. Wheat was employed by R & W as a project manager until he was terminated on May 2, 2014 at the age of 77. The majority owners of R & W, Rogers and Willard, made the termination decision. Wheat’s claim that he was fired because of his age was based on notes prepared by Rogers on May 29, 2013 from a conference he attended that month. In the notes, Rogers stated: “Fire all the old people”; “many large companies bringing in new blood”; “Paint a vision of what company will look like in three years, i.e., new, younger employees.” The parties agreed that Wheat was the “Ralph” referenced in Rogers’ notes. The evidence established that R & W began terminating the employment of older workers no more than seven months after Rogers’ notes were prepared. In 2013, R & W fired a receptionist who was in her 60’s and accepted the coerced resignation of a superintendent who was in his 60’s. In February 2014, R & W “non-renewed” a contact manager named Jerry, identified as one of the “older guys” in Rogers’ notes, who was 73. R & W filed a motion with the trial court seeking dismissal of Wheat’s age discrimination claim. In doing so, R & W argued that Wheat’s age discrimination was meritless and Wheat was prohibited from bringing his age discrimination claim before a jury for resolution. The trial court denied R & W’s motion for dismissal and ruled that Rogers’ notes constituted sufficient evidence for a jury to find that Wheat was fired because of his age. The trial court found that Rogers’ notes were direct or “smoking gun” evidence that Wheat was fired on the basis of his age because the notes say “Fire all the old people” with Wheat identified as an “older guy.” The trial court explained that saying “fire all the old people” is “to fire them precisely because they are old” and identifying Wheat as an “older guy” directly “marks him for termination because of his age.” “There is not the slightest subtlety or ambiguity” in Rogers’ statement, the trial court observed, “and it falls within the most blatant of remarks” whose intent could be nothing other than to discriminate on the basis of age. In denying R & W’s motion for dismissal, the trial court also expressly rejected R & W’s “just kidding” defense. The trial court explained that to accept R & W’s position that it was entitled to dismissal of Wheat’s age discrimination claim based on Rogers’ “assertion that he did not mean what he wrote” would “amount to an automatically successful ‘just kidding’ defense.” Indeed, the trial court pointed out, to dismiss Wheat’s age discrimination claim based on Rogers’ “spin on what he wrote” would mean that discrimination claimants could never present their case to a jury even when they had smoking gun evidence of discriminatory intent. It was for the jury, the trial court pointed out, to decide whether Rogers’ intent was discriminatory or benign. In making that decision, the trial court observed, the jury would not be required to accept Rogers’ “self-interested explanations over the plain meaning of the words themselves.” If Wheat convinced a jury that Rogers’ notes show that he intended to discriminate on the basis of age, the trial court concluded, Wheat would prevail at trial. Based in Ocala, Florida and representing employees throughout Central Florida, we have extensive experience representing victims of age discrimination. 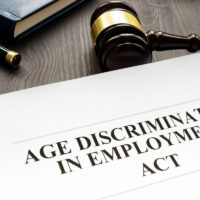 If you have been the victim of age discrimination or have questions about your rights under age discrimination laws, please contact our office for a free consultation with our Alachua County, Florida age discrimination attorneys. Our employee rights law firm takes age discrimination cases on a contingency fee basis. This means that there are no attorney’s fees incurred unless there is a recovery and our attorney’s fees come solely from the monetary award that you recover.